It's hard to know where to start. For me, it begins with modern dance and then ballet: Their historic relationship of rebellions and reconciliations inform my inner dance life. But there is so much more. Dance was the first human artistic expression. Dance and the drum. Before language there was the sound of our nascent souls moving in this glorious skin and bones. We all have the instrument. And it's all dance. Whirling around the kitchen, a grandbaby on your hip. A little girl dancing on her daddy's wingtips. Stamping feet in a Greek dance or a Jewish dance or an Armenian dance that your family has done for generations. Skipping down a path in the woods hand-in-hand with your best friend. Rocking out at a Dead Show. Dancing the 32 fouette pirouettes in the Don Quixote Ballet. Waltzing at your own wedding. Attending a Native American pow wow. It's all dancing. It's all the same deep down. Brava! Dance Eureka, an Ink People Dreammaker project under the astute direction of Virginia Niekrasz-Laurent, presents Classical and Contemporary Works at Van Duzer Theatre on the HSU campus. Aficionados of Humboldt ballet history will not want to miss Virginia's return to the big stage, after nearly a decade, with a full two-act concert including revivals of her classical repertory, the premiere of a contemporary ballet finale and works by student and guest choreographers. Working with Brava! Dance Eureka, the company at The Dancers' Studio, she brings together younger studio students and friends to perform this rich program of old favorites and new works. Act I features Niekrasz-Laurent's restaging of her choreography from the classical ballet oeuvre, including variations on the "Jewel Fairies" from Aurora's Wedding along with a graceful septet, The Sleeping Beauty Waltz, and Odette's second act, the "Swan Lake Variation," featuring Halie Gordon dancing (aaahh..) the white swan, the epitome of ballerinadom. It continues with Swanhilda's Act III variation from Coppelia, highlighting spirited Taryn Middaugh, and excerpts from the romantic ballet Les Sylphides. Act II showcases contemporary work including modern, hip hop, lyrical and rhythmic gymnastics. While Virginia is, at times, an old-school classicist, she has graciously opened the way for her students and company members to test what they can do on their own or working with emergent and experienced choreographers, including guest artists. Thus you will see some of the work debuted in late April at the Two Left Dance Project repeated on the Van Duzer's big stage (disclosure: That includes a piece I choreographed). The program ends with the premiere of a contemporary ballet by Niekransz, Back to Bach. The one-night-only performance is Friday, May 20, at 7:30 p.m. at HSU's Van Duzer Theatre. Tickets are available in Eureka at the Dancers Studio, 1011 H St., and Linden & Company Salon & Spa, 1122 5th St., and in Arcata at Rookery Books on the Plaza. Info: 442-7770 or www.danceeureka.com. Get ready for Prancing Ponies, Tigers, Peacocks, Cotton Candy, Lollipops, Elephants, Seals and Dancing Bears as North Coast Dance's youngest ballet dancers perform pieces from their most recent children's production, Circus of Dance, in "An Afternoon of Dance" on Sunday, May 8, at 2 p.m. at the Morris Graves Museum, 636 F St., Eureka. Each dance was made for a class of kids by their teachers, who are all lovely ballerinas in the grown-up company. The night before, dance lovers can support student dancers at a North Coast Dance's Scholarship Fundraiser and Garden Party -- "So that any child who wants to dance CAN!" The garden party theme is in honor of N.C. Dance Artistic Director Danny Furlong's Roman Gabriel dance/theater piece opening on June 17. With garden attire suggested, this sounds like an elegant affair (think Ava Gardner in a belted dress with a full skirt, open-toed wedgies, seersucker suits). They'll have tasty garden fare and spirits, a Dutch raffle, a live auction, games (croquet, anyone?) and dancing to live jazz by the Mary Jo Casasanta Trio. What a great notion, dancing to raise money for dancing. Saturday, May 7, 6-9 p.m., at North Coast Dance, 426 F St., Eureka. Tickets are $20. 442-7779. Local dance maven Bonnie Hossack has moved her modern dance classes to new digs in Arcata's Pan Arts Studio. After many requests, along with the well-established Sunday morning class Bonnie is adding Wednesday evenings, giving dancers another chance to flex their modern dance muscles. She'll also continue her teen class, where young dancers add modern chops to their pre-professional training. After a career in San Francisco dancing with the likes of Cheryl Chaddick and The SF Moving Company, Bonnie is modern-dance savvy personified. She's also hilarious. Other local dance artists teaching in the space include Laura Munoz from Dell'Arte, teaching Contemporary-Release Technique which emphasizes the use of gravity and momentum; Jandy Bergmann of the HSU dance faculty, guiding Feldenkrais sequences of gentle movements; and Lisa Townsend Schmitt, the face of the College of the Redwoods dance department for 20 years, teaching a Pilates mat class. Be on the lookout for guest artists, workshops and classes for kids in the future. This is about the only place in town to take official, bona fide modern dance from official, bona fide modern dancers. Pan Arts Studio is at 1049 C Samoa Blvd. in Arcata at the intersection of Samoa and K. 826-7416. 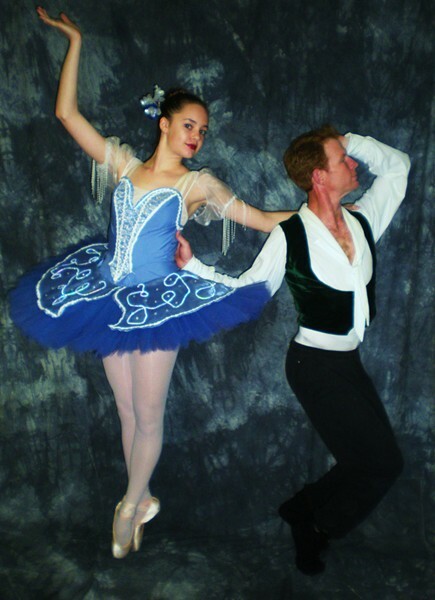 At the end of the month, May 27-29, New World Ballet reprises its original ballet A Humboldt Cinderella at the Arcata Community Center. The dance piece, focusing on the unique and whimsical lifestyles of North Coast residents, includes guest dancers from New York City's Metropolitan Opera Ballet and Virginia's Richmond Ballet.